Looking back over my last post Gift Ideas for the Sensory Kid, I know I could’ve included even more gift ideas. So here I am – back with some more tips. I am pretty excited about this product, which I bought a couple of weeks ago to put under the Christmas tree. Crayola has come out with lots of new products lately, and not just crayons. 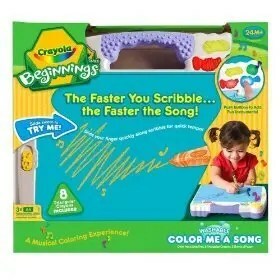 This Color Me a Song contraption plays music as your kid scribbles, almost like free-form, colorful jazz. You can actually set the item to four different instruments and four different music types, including salsa and country. I haven’t completely figured out how it all works yet. But I do know that my son, who loves music and loves to color with REAL color (not just aquadoodle!) – will dig this. I think you may also be able to “record” your little one’s masterpieces, or at least play them back. Hopefully, it will also encourage my son to color within the lines of the Color Me A Song toy and not on the carpet or walls. Many many kids with spectrum disorders also have feeding sensitivities. I’m not talking about the whole GFCF diet, but issues with texture and color. 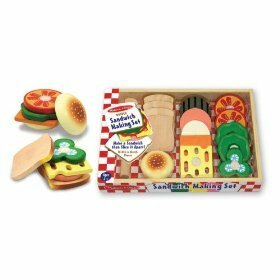 One of my son’s past therapists used to come by with a different Melissa and Doug fake food set, which she said was good for pretend play. The thought is that making eating and playing with food fun will make your child warm up to the idea of trying a green bean or something with sauce on it. This little set is really cute and comes with fake buns, lettuce, cheese, tomato, sandwich meat and a wooden knife to cut through the sandwich when you’ve finished making it. Of course, the knife is good for promoting fine motor skills. Yes, this is a good starter set of fake food and I like that it’s wooden and not plastic. If you want to get a little crazier, you can also get Melissa and Doug’s Sushi Set. I know that some kids on the spectrum are sensitive to noise while others relish it. My son’s in the latter camp and loves music (as I noted in the description above of the Color Me a Song from Crayola). This little animal band was something his speech therapist would bring to play with a lot when we were just starting out on some early intervention tactics. There are wooden finger symbols,; a percussion instrument shaped like a fish that you strike with a small mallet (not quite a drum); maracas; a clapper; and animal bells. The cute little critter band is good because it helps with fine motor skills, coordination, learning rhythm, and learning songs and speech patterns to the sounds of self-made – and not battery-operated – music. I’m no therapist myself, but I bet that regular exposure to music using this band would also benefit kids for whom loud noises are difficult. These are kind of a no-brainer as they’ve already got the word “sensory” in the title. These knobby, nubby balls are better than the regular rubber balls you get at the drug store. My son loves to play with his sensory balls – picking them up, rubbing them on his skin and on his head. His little brother also likes them as they’re easy to grasp. 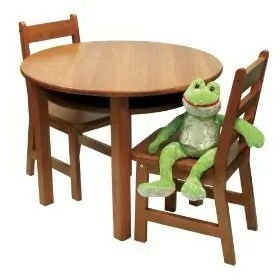 For kids who like to run around all the time, a table and chair set seems counter-intuitive. But here’s another thing I’ve learned from the special education professionals: it helps to have a dedicated spot where kids can sit and play quietly, either rolling out play dough, building block towers, coloring, or reading a book. At first, it’s really hard to get a sensory kid to want to stay still and sit down, and you may only get them to sit there for 15 minutes at a time. But that’s part of the process of learning how to stay on-task and concentrate. If you get a table and chair set, this table and chair set from Lipper is quite handsome. If you plan on making more messes, you may want to consider a Little Tikes plastic table and chair set. This Ready, Set, Art Table is a colorful option with an art caddy, but I prefer seats with backs. At any rate, getting your sensory toddler used to sitting at a table will definitely help transition him or her for the type of quiet play typical of preschool or kindergarten.